Call Douglas Anderson for your private showing. Cell: 574.250.3020. 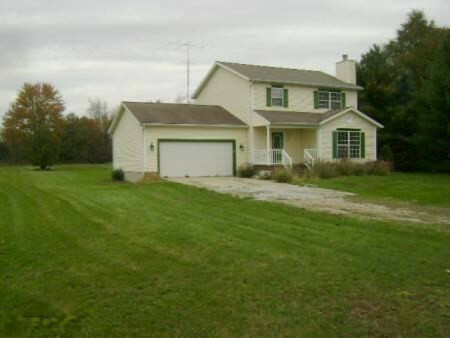 Thanks.Very Nice & Quiet country location, yet close to Berrien Springs, Eau Claire, Dowagiac, Niles, Buchanan & US 31. 1 acre yard with opportunity to have a very large garden. Basement has 1 bedroom and is ready to have the rest of the basement finished, w/3 egress windows. 4 total bedrooms & 2 1/2 baths. Large kitchen w/large pantry & island, with a large bay window overlooking the back yard. Wood fireplace in livingroom. Nice open floor plan on main level w/wood & ceramic floors. Oversized 2 car attached garage. Covered front porch & deck off formal dining room. Large walk-in closet in master bedroom. Refrigerator, stove, dishwasher, washer, dryer, & water-softener included. Linen closet next to full bath upstairs. All bedrooms are good sized. EverDry system installed in April of 2009.